Aka tofu cubes meet a crunchy baked coating. These little bites got so much love on my social media story at the weekend and I am so excited to share them with you. I’m not usually one for ‘fake meats’ or ‘meat alternatives’. I love tofu, tempeh and seitan but when they’re deep fried to replicate meat junk food, that’s just not my jam. I will have a vegan junk food style meal every now and then – especially when in Budapest – but I’d much rather it didn’t have all the grease and ‘junk’ in it! So, when a few girlfriends and I were talking about the best vegan places in London and a certain fried ‘chicken’ restaurant came up, they were surprised to hear I’d never been. With so many healthful and delicious plant-based cafes popping up, I didn’t share their desire to try out the popcorn ‘chicken’ – although if you take me there I am sure I would try it out. How about I make a healthier, easier and baked version myself? I set the challenge and I’m so pleased with the result. These Vegan Tofu Nuggets are just as I hoped they’d be: crispy on the outside with a tender inside. The mix of textures is amazing and really does replicate what I remember the original to be – without the need for a deep fat fryer or even a frying pan. So what makes them crispy? 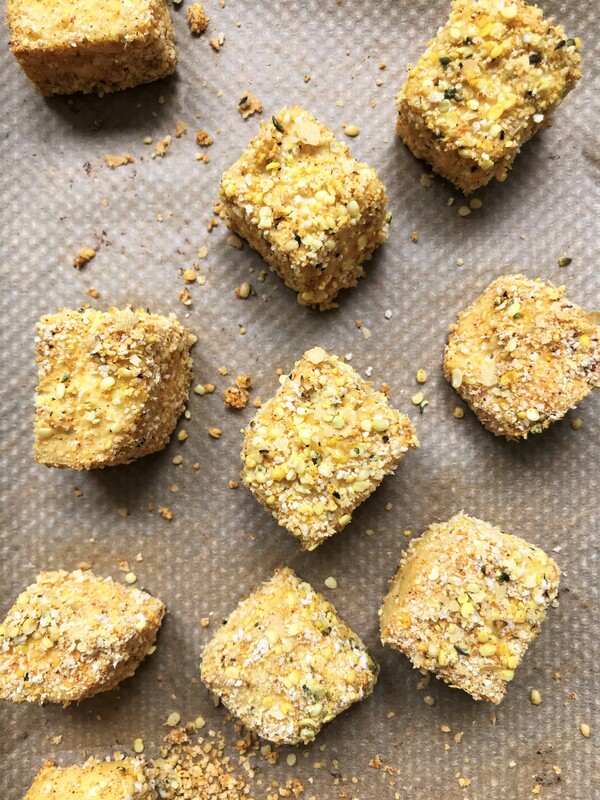 Dipped in almond milk and then coated in a vibrant mix: dried breadcrumbs, hemp hearts, nutritional yeast, turmeric, smoked paprika and garlic powder. Then baked to golden perfection and served with Spicy Tomato Sauce. Let’s get dipping and coating those tofu cubes! Preheat the oven to 170Fan/190*C and line a baking tray with parchment paper. Pat the tofu dry and cut into about 18 cubes. Place the milk in a shallow bowl. Mix the bread crumbs, nutritional yeast, hemp hearts, turmeric and paprika in a small bowl and season with salt and black pepper. Dip the tofu cubes in the milk a few at a time and then place into a ziplock bag with some of the nugget coating. I worked with about 6 cubes and 1 heaped tbsp of the coating at a time. Shake the bag to coat the cubes evenly with the nugget mix and place carefully onto the baking tray. Repeat until all of the cubes are coated. Any leftover coating mix is great sprinkled over salads, pastas and grains. Bake in the oven for 25-30 minutes, or until golden and crisp, turning the cubes over carefully half way through. Meanwhile, make the Spicy Tomato Sauce by mixing together all the ingredients in a small bowl. Taste and adjust the seasoning: more sriracha for heat; more paprika for smokiness; more tamari for savoury saltiness or more honey for sweetness. Serve warm with the sauce or leave to cool and enjoy later. These nuggets will keep well in an airtight container in the fridge for up to 3 days. What are your thoughts on vegan meat alternatives? 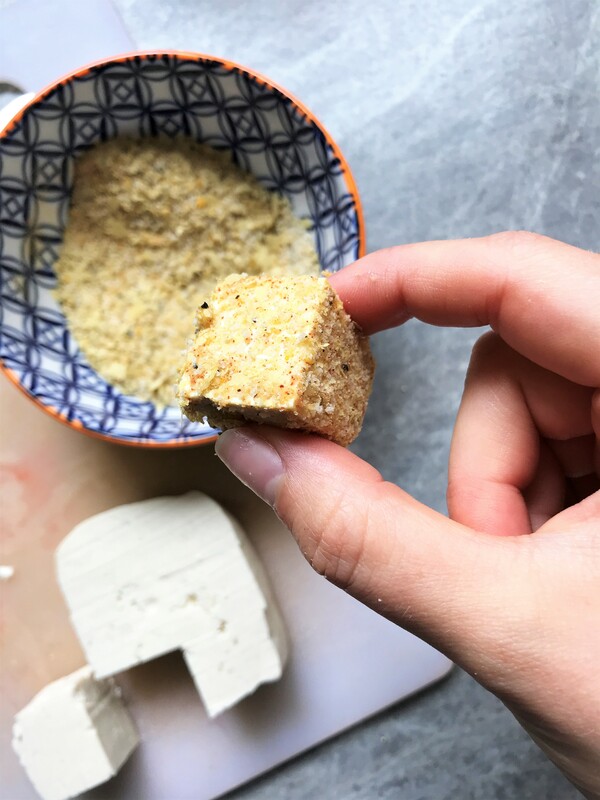 I would love to hear your thoughts, and please do let me know if you make my Vegan Tofu Nuggets with Spicy Tomato Sauce by tagging me in your creations – I’m @nourishing.amy on Instagram and use the hashtag #nourishingamy. Your Tofu Nuggets look and sound amazing. I love the idea of them with the Spicy Tomato Sauce – I can imagine that the spice offsets the tofu perfectly. These look incredible! Crispy and healthy – yes please!